Panjim is in a beautiful location – the centre of the city is on a peninsula, at the point where two rivers meet and empty into a vast estuarine bay. On the west coast, ocean waves break against orange-yellow sand dunes, and to the east, mangrove forests and broad stretches of water provide an open, natural feel. 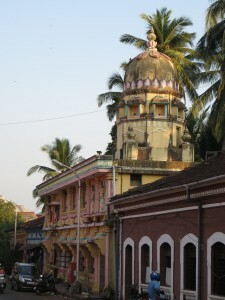 The Portuguese occupied Goa for centuries, and there is a wealth of beautiful European-style architecture, especially in the Old Town area on the point. 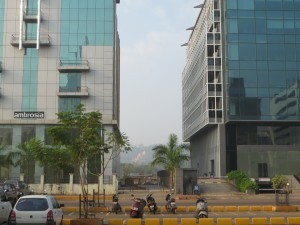 The Hindu culture is also represented, though, with temples casually interspersed between the European-style buildings. 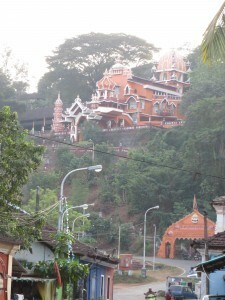 We could see this temple from our guesthouse – Maruti Temple is one of the largest and most famous Hindu temples in Panjim. 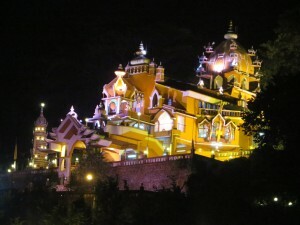 At night, the temple was beautifully lit – a camera can’t really do it justice. There weren’t many restaurants or cafes within walking distance of our guesthouse, but we found one cafe associated with a hostel that did a really good breakfast, and had fast WiFi and air conditioning. Our room also had air conditioning, so we were super-productive in Panjim, working on our bitcoin software project as well as some writing. 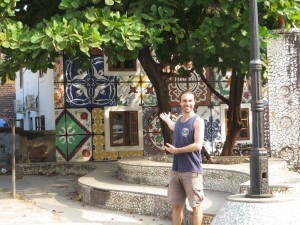 Outside the cafe was a small public park, which was magnificently maintained, and had a tiled mural. It was so rare to find public space so well-maintained in India that it became one of the pleasures of our day to walk past as we went to the cafe. 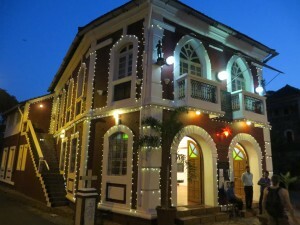 With the Portuguese influence, Christmas is a thing in Panjim, including modern aspects of Christmas, such as Santa. There is always a uniquely Indian touch to these appropriated symbols, though. 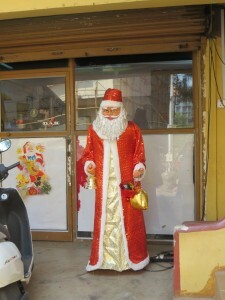 Santa statues are dropped into places where otherwise there might be a Shiva or Ganesha statue. Sometimes they are even decorated with garlands of flowers, and have offerings of rice and fruit at their feet or in their outstretched hands. Santa also wears priestly robes, not pants and big boots. Santa is treated more as a saint here, as if he were the original Saint Nicholas, rather than the bastardised version of St Nick that gave Coca Cola an opening to forever associate their colours with the biggest holiday on the Christian calendar. It’s weird, to see Santa treated with reverence, rather than as a jolly, red-and-white dispenser of consumer goods, but also somehow nice. 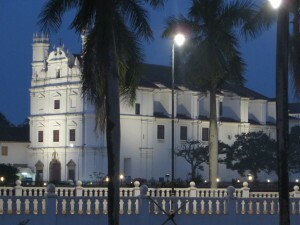 At sunset one day, we went to see the two most famous churches in Panjim. Se Cathedral is one of the largest Churches in Asia, and is beautifully maintained with its pristine white paint. 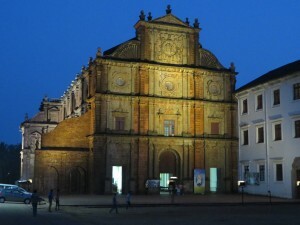 Bom Jesus Basilica is a smaller, baroque-style cathedral with huge buttresses. 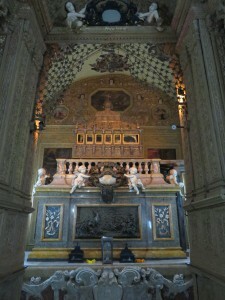 It is the resting place of the remains of St Francis Xavier, who worked tirelessly to evangelise India for most of his lifetime. There were Christians in India when the Portguese arrived, thanks to the efforts of Christian apostles in the first century, but their practices were appalling to the Catholic Portuguese – they considered Jesus to be an avatar of Vishnu, and had seamlessly integrated their Christianity into the highly-flexible Hindu theology. St Francis spent his life explaining to them the error of their ways, and introducing to them the notion of a single, jealous God, with just one Divine Son, and no other personified aspects. Judging by the amount of idolatry and syncretism we witnessed in Goa and Kerala, he was not entirely successful. He is, however, much revered and loved, and even (though he might roll in his grave) worshipped at his tomb with offerings of fruit, flowers and incense. We spent quite a bit of time walking around the Old Town area, as our guesthouse was in that part of town. One interesting local feature was the use of steel gates to provide some measure of security for homes that needed all the doors and windows open for ventilation purposes. 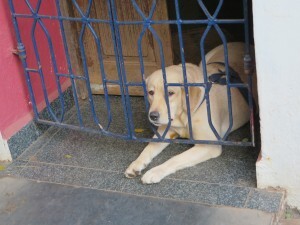 This poor dog was at the front door of its house almost every time we walked by, with its nose pushed as far through the bars as it could reach, trying to make contact with the outside world. It’s a shame that such security is required these days – it was easy to imagine a time when these rainbow-coloured buildings had completely open doors and windows, and neighbours freely walked in and out of one another’s homes in peace. 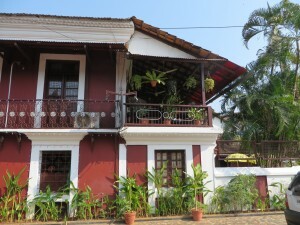 The lovely, well-maintained buildings were a key feature of Panjim for us. 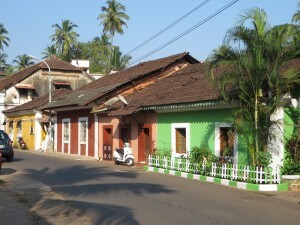 Having just spent two weeks on Arambol Beach, we didn’t feel the need to spend much time on Panjim’s beaches. We were warned by locals that the currents there can be quite dangerous, because of the meeting of the two rivers. As Australians, we are reasonably confident swimmers, but having air conditioning reduced the need to get wet on a regular basis, and the bathroom in our guesthouse had an actual BATH, and enough hot water to fill it, so we were not compelled to seek refuge in the ocean. We located one local restaurant which specialised in Goan dishes, and enjoyed the flavours of Indian spices there quite a few times. We also found a local small bakery, and had pastries as a meal more times than we probably should have! Ravi had another illness, and after five days of fever and a raging overnight headache, we took him to a hospital (there was one in walking distance, fortunately), to have blood tests. Having confirmed that it wasn’t malaria or dengue, we settled down for more rest and fluids until it passed. 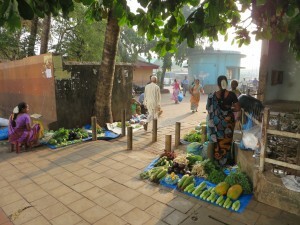 We walked to the bus station to buy our train tickets to Kerala, and were pleasantly impressed with the tidy little market at the entrance, and the small precinct of modern buildings that surrounds the bus station. And on the way through, we came across a murder of crows feasting on two dead rats, so some of the former inhabitants of the area have clearly managed to find a niche in the new environment. As it turned out, after two long, hot, fruitless walks to the bus station, we couldn’t buy our train tickets at the bus station after all. We would have to take our chances with the Tatkal (emergency allocation) tickets, that are only sold on the day the train leaves.